After losing the first set, girls' volleyball caught fire, winning the following three in route to a victory over Monrovia. 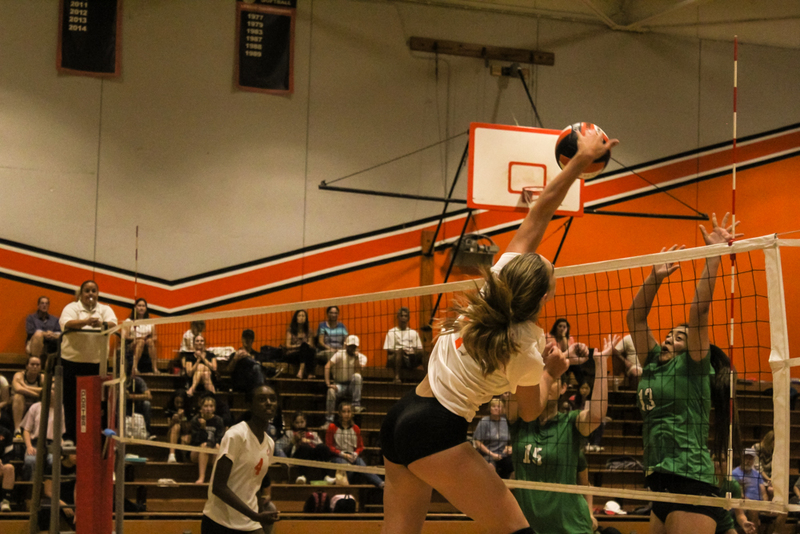 Girls’ volleyball defeated Monrovia High School in four sets on Thursday, September 27. The Tigers had previously lost against the Monrovia Wildcats earlier in the season, but made a solid comeback, improving their league score to 4-2. SPHS started off the second set with a 5-0 lead, largely due to sophomore Lola Foord’s relentless spikes. From there, senior Kimmy Brown tipped the ball over, securing another point for South Pas. With impressive blocks by senior Christina Taylor, and essential sets by sophomore Lexi Schroder, the Tigers were sure to win the set. SPHS won the set with a final score of 25-18. Determined to win the next set, the Tigers showed no mercy, brutally defeating the Wildcats. With the Tigers up by seven, senior Lindsey Kuwahara blocked the ball, which was then set by Schroder to Brown, who spiked the ball. From there, the Tigers continued to stay ahead, maintaining a comfortable lead over the Wildcats. Foord finished off the set with a powerful spike, securing the set 25-12. With spirits running high after a victory in the previous two sets, SPHS was driven to win the third. However, the win didn’t come quite as easily as the previous sets, with the Tigers starting off several points behind the Wildcats. Nonetheless, South Pas surpassed Monrovia at 7-6 with a block by Taylor. From there, SPHS easily exceeded Monrovia, leaving them down by nine. Foord impressed the crowd with a powerful kill, earning deafening cheers from the crowd. SPHS finished off the final set by a score of 25-18. Girls’ volleyball will be playing an away game against La Cañada on Tuesday, October 2, at 3:30. SPHS beat the La Cañada Spartans at a home game earlier this season.